Lawyers take on Donald Trump’s Muslim ban. And because we still live in a country where the law matters, they won. For weeks, we have been wondering about the lawyers. What suits would they file? Would they have standing? Could they have any impact? Saturday, the lawyers showed up. Bigly. And happily, for America, the courts are still independent, and largely allergic to “alternative facts.” This is a country where the law matters and the Constitution endures. And it’s also a country in which hordes of lawyers just showed up at airports to defend detained travelers ensnared under Donald Trump’s lawless and unconstitutional Muslim ban. 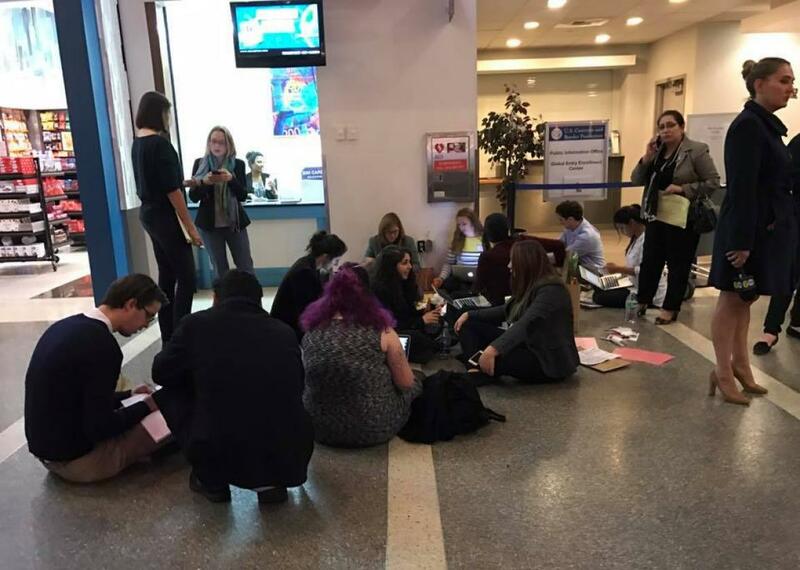 In San Francisco, the massive crowd at the airport chanted “let the lawyers in.” At JFK in New York, lawyers hunched on the floor over their laptops, filing emergency habeas motions. In Philadelphia and Chicago and at Washington Dulles, the crowds asked for nothing more than this: Let the lawyers speak to their clients. And in Brooklyn, U.S. District Judge Ann Donnelly, an Obama appointee, in an emergency hearing, stayed a big chunk of the executive order on the theory that forcing the detainees at the airports to return to their countries of birth would cause them grievous harm. The ACLU challenged the Trump administration’s broad and chaotic ban on Saturday morning, and by Saturday night, Donnelly had ruled that no immigrants with visas should be trapped in airports just because they happened to be traveling on the day Steve Bannon was writing executive orders. This was the first time the judicial branch has been allowed to opine on the fact that Trump is president of the United States. It may also signal the possibility that if real, grown-up lawyers aren’t vetting White House orders, they should probably think about doing that. It is every American’s patriotic duty to protest against violations of our values of freedom of religion, equal dignity and equal protection of law. Trump is sowing seeds of further division based on religion, which reminds us to what took place in Germany during and before second world war and my brothers and sisters of Jewish faith suffered holocaust atrocities just because of their faith. We will not let Trump violate our constitution and its values, we will protest, seek justice in the courts, ask congress to pass legislation to declare Trump executive orders void. Until tonight it was not unreasonable to wonder whether the scientists, the National Park Service, and the good wonky people of NASA, would be alone on the hustings defending the basic existence of facts and truth. * Today, the lawyers joined the fight. Donald Trump has no idea how terrifying a blue book and a Lexis password can be. He’s about to find out. Correction, Jan. 29, 2017: This piece originally misstated Humayun Khan was posthumously awarded the highest military honor. He was awarded a Purple Heart and Bronze Star, but not the Medal of Honor, which is the highest military honor. This article also misidentified the National Park Service as the National Parks Service.